I’ve bought a new car. I wanted to drive a German car before I died, so I sold my Peugeot 307 I had bought two years before and got a 2007 Volkswagen Polo GTi. 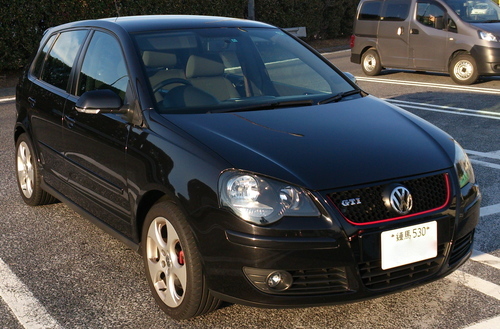 In fact, when I got the Peugeot 307 I wanted to have Audi A4 or VW Golf or Polo to be honest, but my budget at that time forced me to have the French car by compromise. Peugeot 307 was a nice car though. It has a manual gearbox. Probably it would be the last for me to own a manual-transmission car and even the last petrol car I can have, because car makers will sell more and more electric or hybrid cars in the future and such cars would have a continuously variable transmission or a dual-clutch transmission rather than a legacy manual gearbox. I drive it on a weekly basis to get used to its manoeuvres. There are some differences from the Peugeot. At first, a clutch biting point is much lower. As soon as I gently lift my leg with the clutch, it starts to bite. Another difference is that its engine rarely stalls when you lift off the clutch pedal completely in the first gear even with the handbrake on. When you drive on the street, it dashes out very fast by gently stepping on the accelerator. If you give it full throttle, your licence would be at risk. The clutch, brake and gas pedals of the Peugeot were too shifted to the left, but it doesn’t go with the Polo. I have enough foot restraint space beside the clutch pedal. A reverse gear position is different from the Peugeot or other major cars. You press down the gear stick, move it to the left with it pressed down, and then push it forward to put it in the reverse gear. It’s the similar manoeuvre to the first gear, but you should press down the stick before moving it to left and forward for the reverse gear, so you won’t make a mistake. I don’t know how many years I can drive it, but I’m gonna have fun with it.